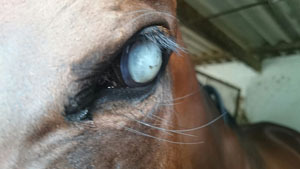 This horse is a successful show-jumper although he only has sight in one eye. He is comfortable but blind (due to the mature cataract) in this eye and in fact has two abnormalities. 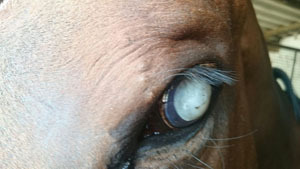 Horses cope very well with the loss of vision in one eye. In this particular case, both changes are likely due to previous episodes of uveitis. Uveitis is the inflammation of the uvea, the middle layer of the eye between the retina and the sclera (white of the eye). As you will see, firstly, his entire lens is opaque – this is a mature cataract. A cataract is an opacity of the lens or its capsule. 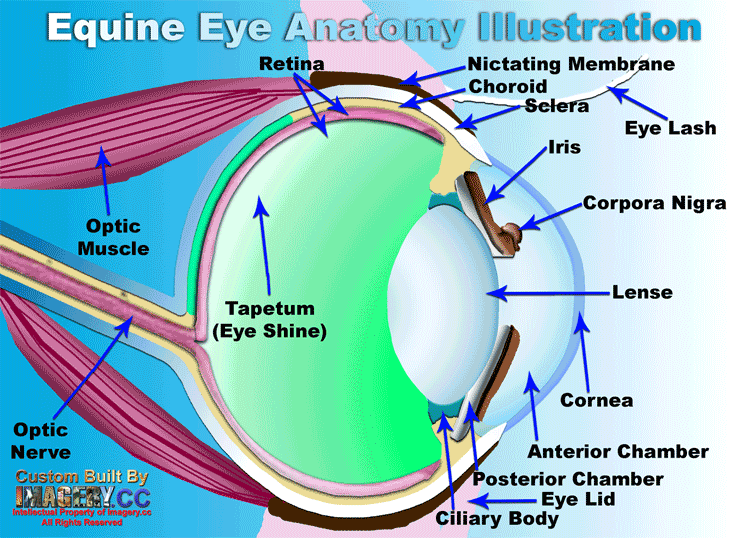 The cornea is the clear, dome-shaped area that covers the front of the eye. Light passes through the cornea before reaching the retina in the back of the eye, and so it must remain clear so light can pass through. Corneal opacities can cause anything from minor irritation to vision problems and even blindness. -Trauma to the foetus during late pregnancy of foaling, or infectious disease or metabolic imbalances while the mare is pregnant. -A result of recurrent uveitis. Secondly, the lens is subluxated (displaced) from its normal position behind the iris to an abnormal position in front of the iris and into the anterior chamber. This can occur secondary to trauma or chronic uveitis, or occasionally as a congenital problem. 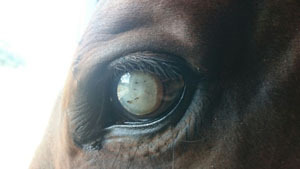 Should the horse suffer from a chronically painful eye, or have an increased intra-ocular pressure, or the lens is unstable, then the lens should be surgically removed, however it must be noted that surgery for cataract or lens removal in the adult horse is rarely successful and fraught with complications. 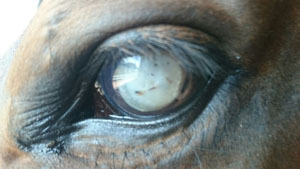 It also results in the horse being far-sighted in that eye. 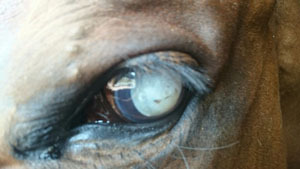 In extreme cases, and especially if the horse has a chronically painful eye, the eye may also be removed. Small, non-progressive cataracts require no treatment.